How do you get to El Nido? Although El Nido is one of the most popular destinations in the Philippines, it is not easy to get there. The city of El Nido is located in the northern part of Palawan Island, 238 km from Puerto Princesa, the capital city of Palawan. This island lies quite far away from the other islands of the Philippines, as the nearest one is 150 km away. Often referred to as the “last frontier” of the Philippines, the island of Palawan is, as one would expect, quite difficult to access. 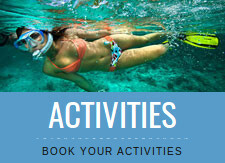 Therefore, going to El Nido is an adventure in itself. No worries though, this article gives you all the options to reach this beautiful city facing the amazing archipelago of Bacuit! Unless you are already in the Philippines, the first step to take if you want to come to El Nido is to get a plane ticket to the country. 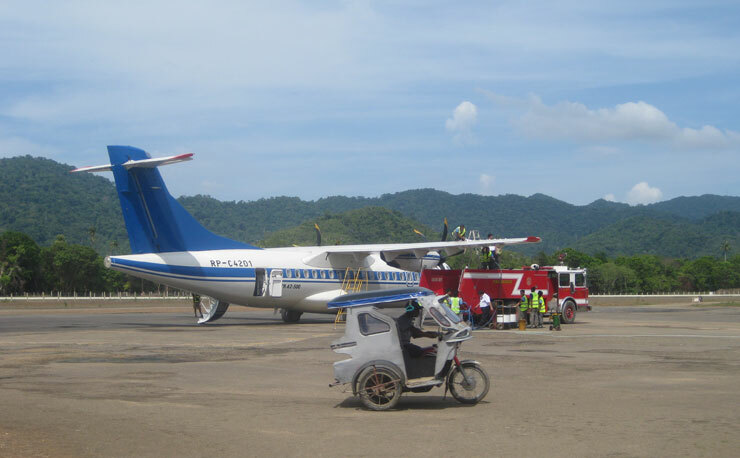 There are several airports on the island of Palawan (El Nido Airport, Puerto Princesa City Airport, Cesar Lim Rodriguez Airport in Taytay, and Francisco Reyes Airport in Busuanga), but none of them are directly accessible from Europe. You will have to take a flight to Manila and then a flight to Palawan. Many airlines offer flights from Europe (or from somewhere else) to the Philippines, but there is no direct flight to date. The lowest price starts around 400 € roundtrip with airlines such as Saudia, Emirates, China Eastern Airlines, or Turkish Airlines, but you could find another. To find the cheapest flight, we recommend that you use the flight search engine Skyscanner; this is by far the most efficient at the moment. 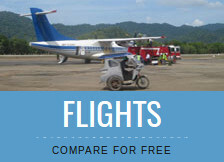 It is definitely the best tool to compare and book flights, whether you are looking for the cheapest or the fastest one, or any flight with other criteria. Once in Manila, several options are available to you. In El Nido, there is a small airport named Lio Airport and located 4 km north of town. You can reach it by tricycle if you come from the city, or by boat if you have chosen to stay in the luxury hotels of the archipelago of Bacuit. The only airline currently serving this airport is Air Swift, with flights to or from the Philippine capital, Manila. These flights have a duration of about 1h30 and are often late. The airplanes also have a limited weight capacity, and each passenger is only allowed to carry 12 kg of luggage (it is always possible to exceed this weight, but a surcharge on the price will be applied by the airline). 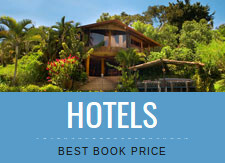 Note that the three daily flights are often booked well in advance, and priority is given to residents of hotels in the bay. This option is undoubtedly the fastest way to get to El Nido from Manila, but it is also the most expensive one (about 130 € each way). Another way to get to El Nido is by sea, first taking a boat between Manila and Coron, then a second one from Coron to Palawan. On one hand, this option allows you to fully enjoy the beauty of the archipelago, but on the other hand, it is the longest trip, requiring a total of 2 days of travel. Once on the island of Coron, 150 km north of Palawan, you will be able to get on a bangka, the typical boat of the Philippines, which leaves every morning to Palawan (if the weather is good enough). The journey lasts between 7 and 8 hours, so do not forget to bring something to eat, lots of water, sunscreen, and a great dose of patience. Of course, it is also possible to come to El Nido from other cities of the island of Palawan, such as Port Barton. However, there is no boat that connects Puerto Princesa to El Nido. 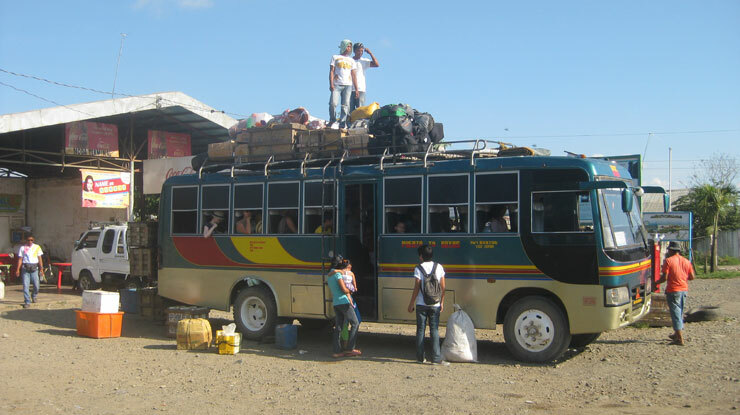 Most travelers choose to fly from Manila to Puerto Princesa, and then reach El Nido by bus or minivan. Air Asia, Cebu Pacific, and Philippine Airlines operate daily flights between the capital city, Manila, and Puerto Princesa with prices starting at around 70 €. The flights have a duration of between 1h15 and 1h25. From Puerto Princesa, the trip then continues on a minivan, which takes between 4h30 and 6h to get to El Nido. The price of the bus ticket is under 15 €, which makes it a very cheap option. Finally, local buses also operate between Puerto Princesa and El Nido, taking tourists and locals to the various towns and villages in between the 2 cities. However, the journey can take up to 9h due to the numerous stops. In this case, the ticket costs a little less than 10 €. From Taytay, the journey to El Nido takes about 2h. The trip between El Nido and Roxas, 140 km further south, takes 6h. From Puerto Princesa, it will take 9h. Whether you choose flying from Manila or taking a bus from Puerto Princesa, you will have to take a tricycle from the El Nido airport or bus station to get to the city’s center. From the airport, the trip will last about 20 minutes, whereas it will only take 5 minutes from the bus station. It is not easy to get to El Nido, but if you want to feel like you’re almost at the edge of the world and enjoy the endless list of things to do there, the ride is well worth it. 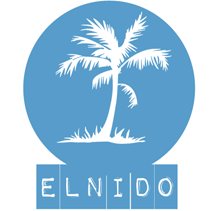 Copyright © 2019 elnidotourism.com - All rights reserved.